Every weekend, Waves offer six 24-hour deals, with those for this Saturday concerning the Dorrough Meter Stereo, H-Delay Hybrid Delay and JJP Bass. A new day means a new door of the Plugin Alliance's Xmas Calendar opens, revealing the Brainworx bx_meter at the hyper-discounted price of $9. Today's offer from Plugin Alliance's X-Mas Calendar is the tuner plugin bx_tuner by Brainworx, available for only $5. This week again, MeldaProduction offers 50% off five of its products, including the recently updated MDrummer. Today only, Waves offers important discounts on its Durrough Stereo meter, Manny Marroquin Delay and GTR3 guitar amp & fx sim. 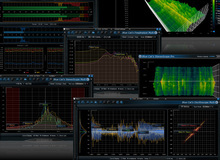 This week, MeldaProduction offers 50% off five of its plugins. For some unknown reason, MeldaProduction seems to be offering 50% off ten plugins this week instead of the usual five.